Black Tiger, known in Japan as Black Dragon (ブラックドラゴン, Burakku Doragon? ), is a 1987 platform released for the arcade by Capcom. The player controls a barbarian hero who jumps and fights his way through a variety of colorful, enemy-packed levels. The sprawling, eight-way scrolling, two-dimensional levels are packed with hidden bonuses to encourage and reward exploration. Though a percentage of these bonuses consist of advice, most come in the form of "Zenny coins", currency that allows the player to buy such items as an upgrade to their weapons and armour, keys for treasure chests, and anti-poisoning potions. Special items that reveal coins, upgraded armor, full vitality, extra lives, extra time, or simply bonus points may be found by attacking certain walls. The player's vitality bar will also increase up to three times as a reward for reaching score benchmarks. The Japanese version has a few changes that makes it more challenging than its American counterpart. Several more "falling rock" obstacles were added to this version. Additionally, the prices of many of the items are higher and more points are needed to increase maximum vitality. But perhaps the biggest difference is related to fighting the later bosses (the three dragons and the dual sword-wielding foes at the end of stages 5 and 7). In the American version, it is possible to duck and avoid taking damage when the bosses touch the player's character as long as one of their projectiles does not hit him. In the Japanese version, the player is not able to do this. The game was ported to a few systems. 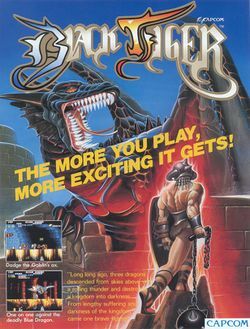 Europe-based U.S. Gold released versions of Black Tiger for Amstrad CPC, Commodore Amiga, Atari ST and ZX Spectrum in 1989. A version for the Commodore 64 was released in 1990, developed by Softworx. An emulation of the arcade game is included in the compilations Capcom Classics Collection: Remixed for PlayStation Portable and Capcom Classics Collection Vol. 2 for PlayStation 2 and Xbox. The arcade version of Black Tiger was released on the Wii's Virtual Console in late 2010 and early 2011. It was also included as the initial game in Capcom Arcade Cabinet for PlayStation Network and Xbox Live Arcade on February 19, 2013. Photographic evidence exists of a canceled port to the Famicom which was under development. Another conversion was initially planned for the PC Engine, but mid-development the project was changed into a sequel to Capcom's SonSon arcade game, and was published as SonSon II. This page was last edited on 10 July 2017, at 18:46.